With more than a century’s experience as a parts supplier, TRW – a ZF Group company – is in a position to help workshops diagnose and rectify steering problems. In this article, TRW considers the possible causes of handling instability in heavy commercial vehicles equipped with integral hydraulic power steering gear. These units comprise a manual steering mechanism, a hydraulic control valve, and a hydraulic power cylinder in a compact package. Being robust and reliable in service, in most cases the gear should be the last item checked after examining other components in the steering and suspension system. In a vehicle displaying a tendency to wander across the road, the driver has to continually adjust the steering to keep travelling in a straight line. There are several possible causes of wander, described as follows. Castor is the angular displacement of the steering axis from the vertical axis of a steered wheel, measured in the longitudinal direction. The castor angle on the vehicle therefore sets the distance between the turn axle line of pivot and the tyre-to-road contact point. To visualise the principle, think of a shopping trolley, where the wheel pivot is ahead of the point at which the wheel contacts the ground – this is positive castor, which improves straight line stability and encourages the steered wheels to return to centre. 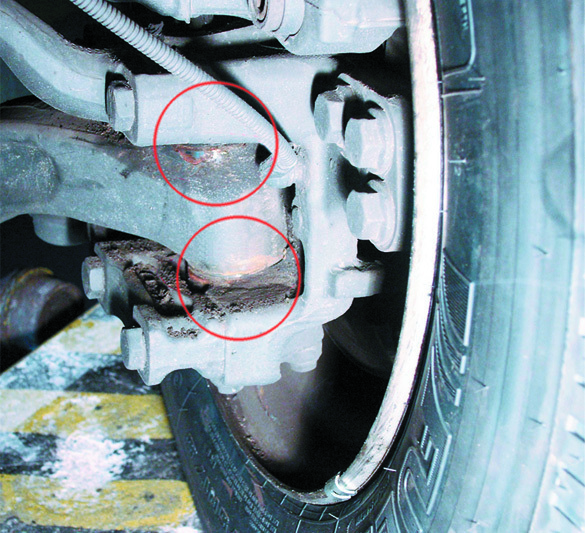 However, excessive castor can cause the steered wheels to follow the road camber, as well as drawing the vehicle into the surface indentations caused by other road traffic. The vehicle wanders across the road as a result, making the driver work harder to control the vehicle. Worn or loose components anywhere in the linkage between the steering wheel and road wheels can allow the steering to change vehicle direction independently of driver input. As the wheels interact with the road, track rods, drag links, pitman arm and steering gear are able to ‘slop around’ within any clearance that has developed in the linkage. The driver has to continually adjust for the wander caused by these random changes in the steering system. The excessive front axle castor and worn linkages described earlier can also give rise to wheel shimmy. The vehicle experiences ongoing oscillations in the steer axle, often causing vibrations in the steering wheel, and the steering may also take longer to return to centre. Shimmy occurs when the force induced by the positive castor angle, which pulls the wheel back to its centre position, becomes so large that the wheel overshoots the centre point and oscillates back and forth like a pendulum. Using the shopping trolley illustration again, the effect is similar to that seen when the trolley is pushed and one or more of the wheels wobbles constantly. Oversteering – often described as darting – is characterised by a delayed reaction to the steering wheel being turned. This can be a serious challenge for a driver carrying out even a simple manoeuvre like changing lanes; the driver turns the steering wheel by an appropriate amount but there is little or no response from the vehicle, so additional lock is applied. Suddenly the vehicle responds to the exaggerated movement by darting across the road, needing a rapid response from the driver to bring the vehicle back under control. There are many possible causes of vehicle darting, but typically it’s due to a partial seizure in the steering system. This can be any part of the steering system including the steering gear, king pins, universal joints or even a poorly maintained fifth wheel. The delay in vehicle response is due to the hydraulic assistance needing to build up enough force to overcome the seized elements of the steering system. 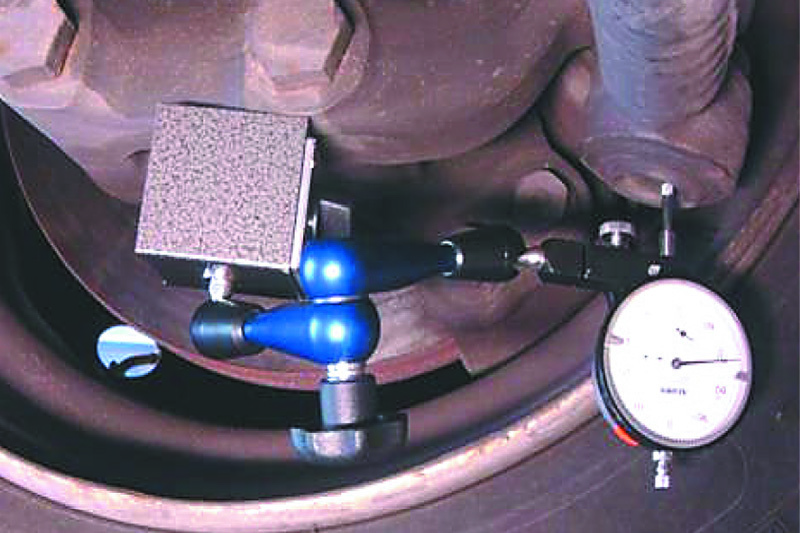 The degree of hydraulic assistance is proportional (via the torsion bar of the steering gear actuating the control valve) to the difference between the steering wheel position and the road wheel position – so with a small movement at the steering wheel there is only a low level of hydraulic assistance provided, which increases as the steering wheel is turned further. Partially seized kingpins can lead to oversteering/darting.